Reduction in maintenance costs. Variable speed drives are inherently soft start, increasing motor and linkage life. Pumps can be alternated more frequently, say every 24 hours, increasing the life of the equipment. On pump failure, the standby pump is automatically started with alarm indication. Start-Stop and reset of pumps can be done by the variable speed drives. Optional manual selector switch overrides the automatic pump alternation sequence. In applications, where increased flow is required , on a temporary basis, the lead or primary pump may remain at maximum flow with the second back up pump enabled and varied to meet the system demand. Pressure booster pumps essentially add pressure to a commercial buildings water supply at times when the water mains pressure is not sufficient. Most multistory apartment complexes, hotels, etc, require pressure booster pumps to supply adequate pressure to terminal units such as showers and bathrooms. VFD can be added to pressure booster pumps as an alternative to using pressure control valves. This saves the energy and eliminates its cost and maintenance. The vfd savings can amount to 20% or more, simply due to the safety factor used during the design of the system. If the suction pressure of the pump varies, the over-sizing of the pump required to handle the lowest suction pressure does not penalize the installation, when the suction pressure increases. I'd be curious also, especially with constant speed motors. Pumps that spend a lot of time on the far left of the curve under varying demands might consider variable frequency drive (VFD).If you have a fixed demand or process (i.e. the old 80% rule of thumb) power factor correction capacitors can save electricity on a lot of motors or a large motor and cheaper than VFDs. You can get an idea of a pump's performance usually from pressure recording equipment if equipped with a steep curve pump. If not many larger electrical starters may be equipped with amp and volt meter recorders amps=flow. The benefits of VFD control on friction dominated systems are well documented as we as methods to record load indicating transducers. There is a dearth of information about actual operating points in the field. Reduced downtime because gas turbines require frequent maintenance while VFDs and motors require very little maintenance. This enables more production, lower maintenance expense, and improved productivity. Accurate speed control and process control allowing the most optimum plant flow balance to be obtained. Lower energy costs because the VFD and motor has a higher efficiency than most gas turbines, especially at part load. Zero CO2 and NOX emissions at the operating station and greatly reduced noise. This feature often makes electric prime movers the only selection in applications near urban regions or regions with existing air quality problems. Independent of ambient temperature. Gas turbines generate less power when the inlet air temperature rises since the air density is reduced and less oxygen reaches the combustion chambers. 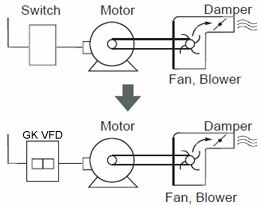 VFDs and motors are not affected by temperature. Lower capital equipment, spare parts and maintenance cost. Lead times of 9 - 12 months, depending on the motor design. Compared to a mechanical prime mover which can have 18 month lead time, this shorter lead time allows for a quicker production revenue gain. Choose a variable frequency drive (VFD) for refrigeration compressor control must be conducted with great care, as a variable frequency drive selected too small-sized may present some disadvantages. These can be avoided by using the VFD selection software. Based on a process of individual selection and qualifying of the variable frequency drive suited for a given refrigeration compressor, safe and energy-saving operation of the refrigeration compressor can be achieved. Experiences made in over 10,000 VFD installations in refrigeration and A/C projects have led to a list of priorities for the correct selection of a suitable variable frequency drive. 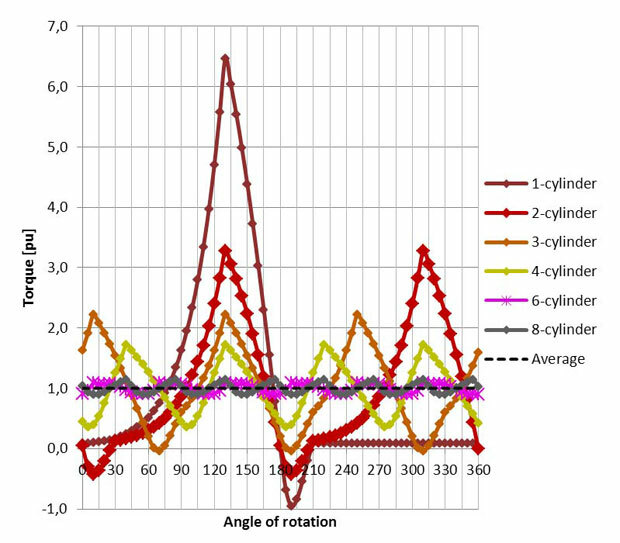 In this study, we develop a virtual vibration and temperature test and analyzing instrument. The virtual instrument controls the VFD (variable frequency drive) to adjust the speed of motor, complete speed changing and speed keeping process to simulate the real working condition. The speed changing and keeping process of wheel-set, the vibration and temperature are being monitored in real time and analyzed, providing basis for fault analysis and diagnosis. VFDs (Variable Frequency Drives) can achieve reduced flow by providing variable speed pump operation. This results in reduced system pressure and operation near the pump's Best Efficiency Point. In addition, maintenance costs might be reduced. This article will discuss the energy savings potential of variable frequency drives followed by a brief description of the operation and relative benefits of VFDs. The most important choice to be made in choosing the VFDs is the decision to select a non-slip, solid-state VFD. Any such VFD can offer dramatic energy savings by efficiently matching the energy consumed to the hydraulic load requirements at any given moment. It's commonly to control a centrifugal pump with a VFD (variable frequency drive) rather than couple a constant speed pump with a control valve on the discharge. However, many engineers don't understand variable frequency drives impact on flow and how that affects control. A pump/control-valve combination provides smooth flow even at very small valve openings, although in some cases protection against low flow is required. However, with VFD-driven pumping, flow isn't always smooth at reduced speeds due to either the pump or the VFD. For a centrifugal pump with a variable frequency drive it's usually preferable to use torque to control flow. This also seems consistent with the future directions for variable frequency drive technology. 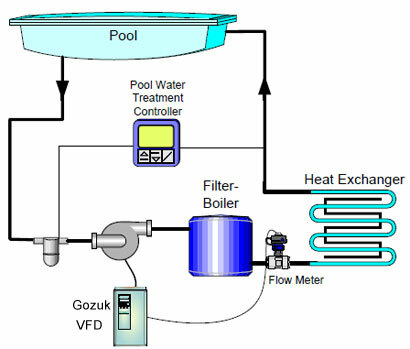 Temperature Control Loop - The chilled water valve is modulated to achieve the desired off-coil temperature. Variable Air Volume Box Control Loop - The Variable Air Volume box damper is modulated to deliver the desired airflow as established by the temperature control loop.